The Ibiza from SEAT has been around for decades now and like all models has evolved with time to meet industry standards in regards safety and efficiency, but during these evolutions comes vast changes to the looks, sizes and shapes and the latest Ibiza is far removed from its previous models. The SEAT line up at present has a few “ST” models which I can only assume, without research, stands for “Sports Tourer” or most commonly known as an estate car for the vast majority and the Ibiza is one of the models that receives ST status. 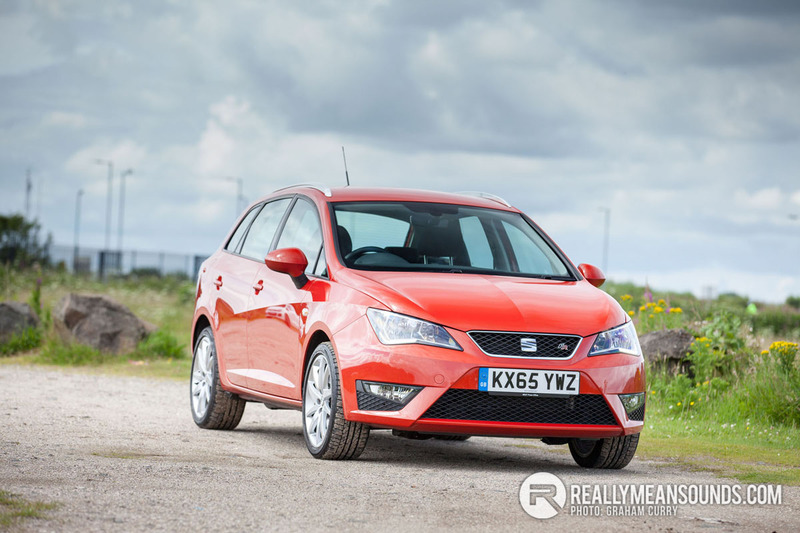 Available in three and five door as a hatchback alongside the five door estate model, this small offering from SEAT is one that will fit many lifestyles and ownership requirements with this ST model being the most versatile. Outside this Ibiza is slightly deceiving as it looks much smaller than it actually is and is finished in a stunning burnt orange sort of colour by the name of “Chilli Red Metallic” at a cost of £530 as an option. The “FR” spec of this car is close to range topping with only the Cupra models providing more spec, as such this car is fitted with FR specific front and rear bumpers with rear parking sensors fitted at a cost of £220. Poking from the lower rear bumper is twin exhausts, establishing the FR model above the lower spec cars. 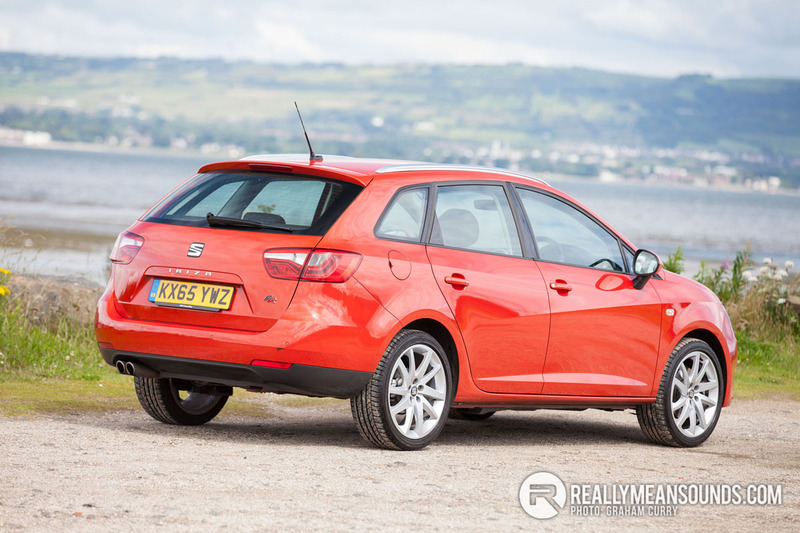 The FR comes as standard with adequate 16” alloy wheels whilst this model from SEAT UK is fitted with 17” “Targus” alloy wheels at a cost of £250. As expected for an estate car roof rails are fitted as standard along with electric folding mirrors whilst automatic lights and wipers bring me around the front where the bonnet slopes down into very angular headlamps fitted with LED technology. 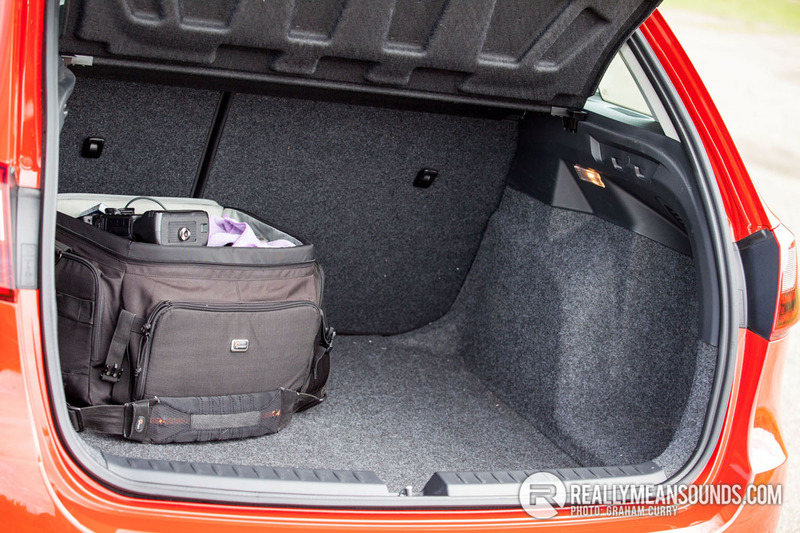 Boot space is more than expected and quite surprising in fact with a usable loading area and with the rear seats folded turns very van like, indeed I used the car as a van for the week I had it whilst doing several dump runs and it swallowed a vast amount of stuff with ease. 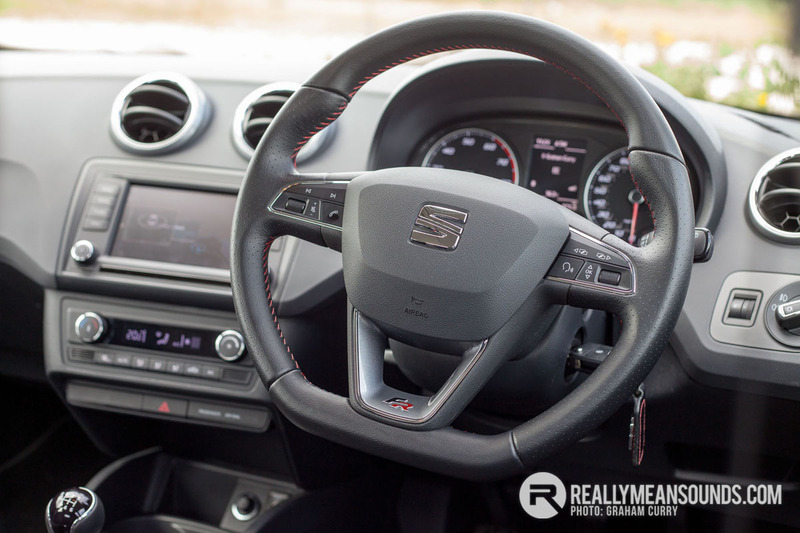 Inside the Ibiza reveals dash and door materials that have improved greatly on SEAT models of the past however are still a little too plastic for some buyer’s tastes. The seats are incredibly comfortable and supportive due to the FR coming equipped with sports cloth seats. Leg room up front is more than ample and the driving position was absolutely spot on for me, with such usable room in the front and the large boot, rear leg room has been sacrificed a little as things would get somewhat cramped with two adults in the rear. Climate control has been added to this model at £320 option and the steering wheel is FR specific, flat bottomed leather ‘wheel with red stitching that flows to the gear stick, handbrake and around the seats for that sports feel. 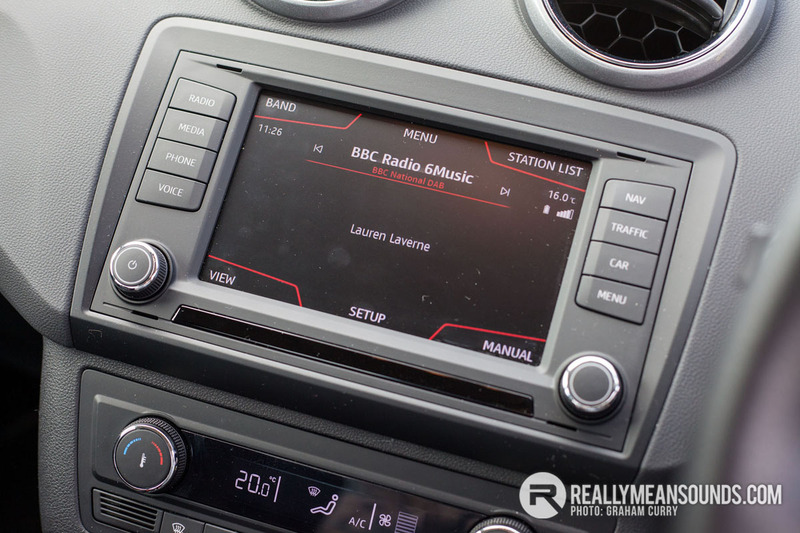 Infotainment is good as standard with this model having an upgraded navigation system (£580) with an added full link connectivity package (£145) meaning the full colour touch screen in the dash displays everything and can play more music than Belsonic. Bluetooth, dab radio, aux input, usb input and sd card input are all on offer with this system whilst the whole lot can be controlled via the screen or indeed via buttons on the steering wheel. The screen also doubles up to display car and driving data. Engine wise this ST FR is equipped with the widely used 1.2 TSi engine producing a potent 110bhp with 129lb/ft of torque and to be fair, for all its size, it is punchy with enough usable torque. Over a week of mixed driving my real world mpg was in the low 40’s. Combined in this car to a 6 speed manual gearbox, 0-62mph is achieved in 9.7 seconds, just 0.6 seconds slower than the hatchback versions. A DSG twin clutch auto ‘box is available as an option, however on this particular engine I think the manual works best. Punchy the engine may well be but it was far from fast though when wound up and going it was fantastic on a meandering road nipping through the top half of the gear range to keep momentum. Handling was great which is to be expected as the FR comes as standard with sports suspension while traction control kept things safe, cruise control aided driver comfort. SEAT offer a 3 year / 60,000 mile warranty with the body receiving a further 9 years. Pricing for the Ibiza range starts at just shy of £10,000 with the ST FR tested coming in at just under £18,000 with annual road tax on the model tested at just £30/annum.